Not to be confused with vessel displacement. The more heavily loaded a ship is, the lower she sits in the water. Maximum DWT is the amount of weight a ship can carry without riding dangerously low in the water. Scale for a 6,000 tonne DWT ship. Deadweight tonnage (also known as deadweight; abbreviated to DWT, D.W.T., d.w.t., or dwt) or tons deadweight (TDW) is a measure of how much weight a ship can carry, not its weight, empty or in any degree of load. DWT is the sum of the weights of cargo, fuel, fresh water, ballast water, provisions, passengers, and crew. DWT is often used to specify a ship's maximum permissible deadweight (i.e. when she is fully loaded so that her Plimsoll line is at water level), although it may also denote the actual DWT of a ship not loaded to capacity. Deadweight tonnage is a measure of a vessel's weight carrying capacity, and does not include the weight of the ship itself. It should not be confused with displacement (weight of water displaced), which includes the ship's own weight, nor other volume or capacity measures such as gross tonnage or net tonnage (or their more archaic forms gross register tonnage or net register tonnage). 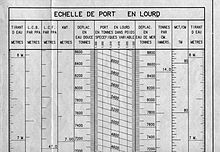 Deadweight tonnage was historically expressed in long tons[note 1] but is now usually given internationally in tonnes (metric tons). In modern international shipping conventions such as the International Convention for the Safety of Life at Sea and the International Convention for the Prevention of Pollution From Ships, deadweight is explicitly defined as the difference in tonnes between the displacement of a ship in water of a specific gravity of 1.025 (corresponding to average density of sea water) at the draft corresponding to the assigned summer freeboard and the light displacement (lightweight) of the ship. ^ a b Turpin, Edward A.; William A. McEwen (1980). Merchant Marine Officers' Handbook (4th ed.). Centreville, Maryland: Cornell Maritime Press. pp. 14–21. ISBN 0-87033-056-X. ^ Hayler, William B. (2003). American Merchant Seaman's Manual (7th ed.). Centreville, Maryland: Cornell Maritime Press. p. G-10. ISBN 0-87033-549-9. ^ Gilmer, Thomas C. (1975). Modern Ship Design (2nd ed.). Naval Institute Press. p. 25. ISBN 0-87021-388-1. ^ McNicholas, Michael (2011-08-29). Maritime Security: An Introduction. Butterworth-Heinemann. p. 30. Retrieved 2014-08-25. ^ SOLAS Consolidated Edition 2009. London: International Maritime Organization. 2009. p. 33. ISBN 978-92-801-1505-5. ^ MARPOL Consolidated Edition 2011. London: International Maritime Organization. 2011. p. 44. ISBN 978-92-801-1532-1.